Soekarno-Hatta International Airport Train became the first transportation infrastructure development project inaugurated by President Joko Widodo in 2018. The inauguration was done directly by the President at around nine o’clock in the morning on Tuesday (2/1/2018). “Alhamdulillah, after three years we are working hard to finish the Soekarno-Hatta Airport train, finally this morning we can inaugurate,” he said during the inauguration. Quoted from the release of Deputy of Protocol, Press, and Media of the Presidential Secretariat, Bey Machmudin, the President revealed that the construction of the airport train is one of the government’s efforts to reduce congestion in Jakarta. The presence of airport trains coupled with the construction of LRT, MRT, and integration with other transportation facilities, He hopes that people are willing to switch to mass transportation. “We hope that people are not using private cars anymore, but they will move to safe, comfortable, and safe mass transports that we can use together, both in Jabodetabek and to the airport,” he said. 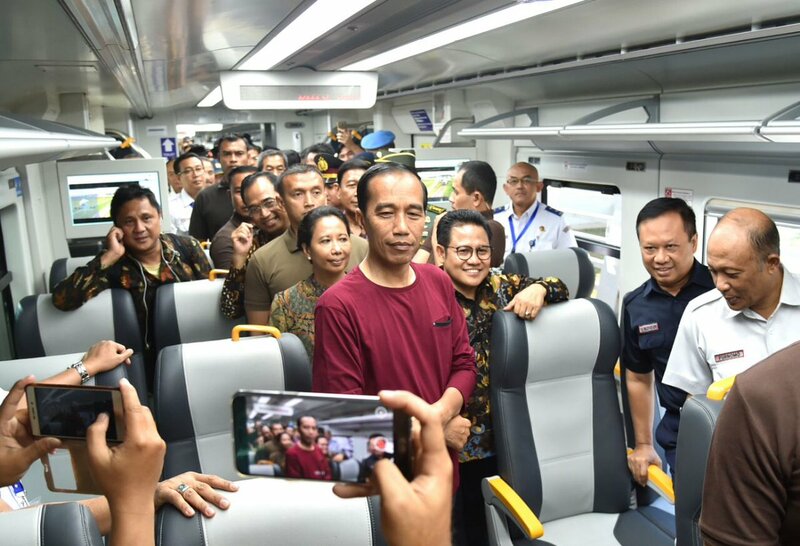 On the occasion, President Joko Widodo briefly tested the operation of the airport train which was built since three years ago. From terminal 3 of Soekarno-Hatta Airport, the Head of State goes directly to the departure station using SkyTrain which has operated first. After inaugurating and reviewing the departure station facility, the President and his entourage then travel by airport train to Sudirman Baru Station. After trying out the train, the Head of State mentioned that the train he rides feels very comfortable and nice. However, for him the most important is the timeliness that can be provided from the operation of the train. “If we see the train is good, comfortable, the most important on time, 55 minutes,” he said in Sudirman Baru Station. To the journalists, he also revealed that the design of the airport train construction is planned to be integrated with other mass transportation modes. Currently the government is also still doing LRT development which is expected to be completed by 2019. “The macro concept is all integrated, so the busway, LRT, MRT, airport train, and fast train are all in design to be integrated,” he said. He also gave his comments related to the costs to be spent if the public wants to use the airport train. Currently, the train rate is set at Rp70 thousand for one trip. The President cautioned that the tariff issue in its calculations should be based on awareness to invite people to move towards mass transportation mode. “This is still calculated, Rp70 thousand we expect to be maintained.This is not just a matter of building an airport train, but also we want to divert private cars to switch to mass transportation, it could be a subsidy from the DKI government why not? the President said. The airport train is scheduled to have a travel route starting from Manggarai Station – Sudirman Baru – Duri – Batu Ceper – Soekarno-Hatta Airport. The route is estimated to be taken for approximately 54 minutes. In the initial operation, the airport train will only temporarily depart from Sudirman Baru Station considering the construction is still being done at Manggarai Station. In the occasion, the President was accompanied by Coordinating Minister for Political, Legal and Security Affairs, Wiranto; Minister of Transportation, Budi Karya Sumadi; Minister of SOE, Rini Soemarno; Minister of State Secretary, Pratikno; Minister of Public Works and Public Housing, Basuki Hadimuljono; Minister of Tourism, Arief Yahya; Chairman of the Advisory Council of the President, Sri Adiningsih and Police Chief General Police Tito Karnavian. Also appear to accompany the President, Chairman of the National Awakening Party Muhaimin Iskandar. When asked by reporters about the reason Muhaimin Iskandar was at the location of the inauguration to the airport train, the President explained that he deliberately invited Muhaimin.